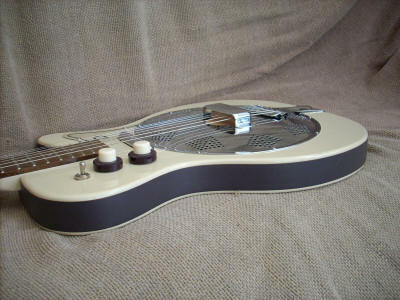 The story of how the Resodan came about dates back to 2000 when Steve Jolly, owner of Holiday Music in East London, asked me whether I could fit a resonator cone to the Danelectro U2. A few days later I was handed a box of parts and a new U2. Over the years the design has changed little, the only notable modifications were to the sound well, which was originally a softwood frame but is now machined from plywood, and the positioning of the transducer pickup. 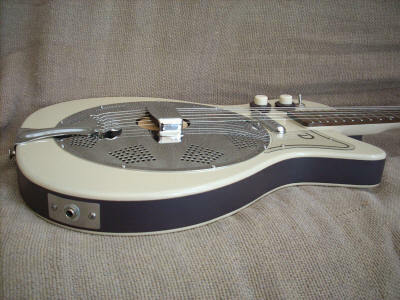 The Resodan features a spun aluminium resonator cone fitted with a National style biscuit bridge and an Ashworth transducer, the original neck position lipstick pickup is retained and the controls, which are moved to the bass side of the top bout, provide volume and treble for each pickup individually with a three way toggle switch selecting the output. Surprisingly only one customer has asked for a stereo output, but this was easily achieved and the output from each pickup was sent via a stereo jack and stereo Y cable into two separate amps. Please note, I do not stock Resodan guitars. However, Resodan conversions of Dano U2's and U2 Pro's can still be performed. Unfortunately I don't have any instruments available for conversion but if you have a U2 and fancy something a little different, give me a call. The price is around £200 plus parts. 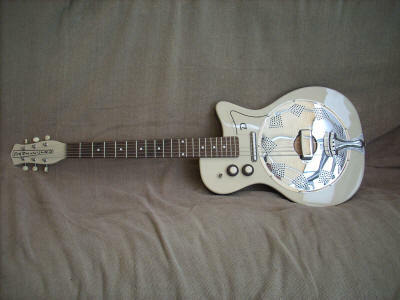 Over the next couple of months I will be working on my own designs for an electric resonator guitar, so watch this space.